The National Health Protection Scheme under ‘ Ayushman Bharat’, is being touted as an ‘advancement towards universal health coverage’ (UHC). UHC is a health policy design rooted in the commitment of ‘Health for All’. The goal of HFA was first articulated in the Alma-Ata Declaration of 1978. 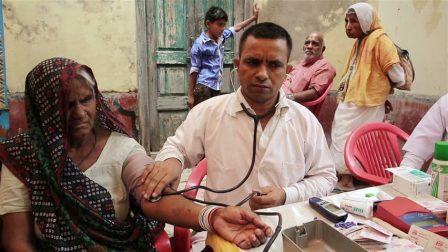 ‘Alma-Ata’ and ‘Ayushman Bhara’t are political commitments in health. The reasoning is that Health for All can be achieved by Universal Health Coverage, and the NHPS is a step towards such coverage. But both commitments need to be tested through conceptual, theoretical and operational indices. The Alma-Ata Declaration reflected the confluence of alternative ideas opposed to technology-driven interventions in health. Ayushman Bharat’s NHPS is based on the principle that citizens are entitled to quality health services without experiencing financial hardship. The NHPS thus offers hospital-borne expenses up to five lakh rupees per family every year. So the poor population’s lack of money is considered to be the biggest hurdle in access to quality healthcare. In India, the number of households that slipped into poverty because of healthcare expenditure increased from 15 per cent to 18 per cent.So, the NHPS seeks to protect people from excessive financial expenses, but not their health. Alma-Ata, however, believed that the health of a population was threatened by the lack of infrastructure, food scarcity, unemployment and under-employment, unequal distribution of resources, political instability and so on. Alma-Ata prioritized both health and social justice whereas the NHPS focuses on financial protection. The NHPS aims to cover almost 40 per cent of in-patient hospital charges based on the deprivation criteria. The logic is that the poor could be protected from the burden of health care cost through hospitalisation coverage. The NHPS believes that such coverage is required by a targeted population only. On the other hand, Alma-Ata acknowledged that the health status of the developing world was unacceptable. Health thus became an issue concerning fundamental rights and disease was considered to be socially produced. Alma-Ata theorized health as a right and a social goal. The difference between the two commitments is related to the role of the State. Alma-Ata declared primary health care to be the focal point of the national health system. The focus was on building State capacity to provide robust health services at the primary level while according due importance to social determinants so that the system could gradually be integrated into other levels of care. NHPS’s operational plan is based on an insurance model where State administrative agencies would purchase health services for the needy from public and private hospitals. The state government can opt for insurance premium payment mode for the targeted population or directly reimburse hospitals for services purchased. In contrast to the PHC approach, NHPS is active at secondary and tertiary levels of care. Under the PHC, the State was the sole financer and provider, whereas NHPS splits the financer from the provider by inducting the private sector. The building of State capacities is being replaced with State-facilitated growth of the private sector for public health goals. The two programmes have similar goals but are antithetical in terms of knowledge perspective and strategic intervention. How would the NHPS cope with private sector regulation? Karnataka, Delhi, West Bengal and many other states have failed to control the burgeoning private sector even after amending their respective laws pertaining to clinical establishment. Can NHPS really achieve health for all ? that’s the question.